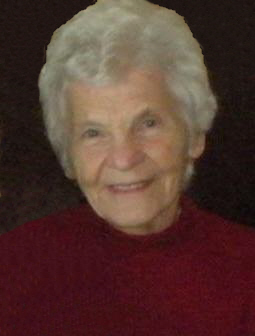 The Mass of Christian Burial, celebrating the life of Elaine R. Gerads, age 89 of Sartell will be 11:00 AM, Friday, February 15 at the St. Francis of Assisi Catholic Church in St. Francis, rural Albany. Burial will be in the parish cemetery. Elaine died Thursday at Edgewood Assisted Living in Sartell. There will be a chance to gather and support the family after 10:00 AM Friday at the church. Arrangements are being made by the Miller-Carlin Funeral Homes. Elaine was born January 10, 1930 in Trail City, SD to Thomas and Mary (Meier) Ripplinger . She worked in Minneapolis until she married Hubert Gerads in August of 1949. Elaine was a homemaker, raising the couple’s nine children. She was an active member of the St. Francis of Assisi Catholic Church in St. Francis. Elaine is survived by her children, Jeanne (Greg) Paulbeck, Nisswa, MN; Joyce (Dale) Applequist, Cologne, MN; Julian (Helen) Gerads, Mesquite, NV; Janice Erdrich, Sartell, MN; Joanne Maloney, Saginaw, TX; Barbara (Mike) Oemcke; Prescott Valley, AZ; Marc (Geri) Gerads, Azle, TX; 21 grandchildren, 26 great-grandchildren and her sisters and brothers; Bernice (Ernie) Skwira, Holdingford, MN; Alvina Mader, New Munich, MN; Mary Kostreba, St. Joseph, MN and Jim (Erma) Ripplinger, Albertville MN. Elaine is also survived by her sister in law, Lucille Ripplinger. She is preceded in death by her parents, her husband, infant son Bob Gerads, her daughter Wendy Gerads and her brothers and sisters, Michael Ripplinger, Helen Ripplinger, Alois Ripplinger, Joe Ripplinger, Paul Ripplinger, Julia Shabel, Frank Ripplinger, Leo Ripplinger, Barbara Schurman and Kathryn Kortenbush. There will be a chance to gather and support the family after 10:00 AM Friday, February 15, at the St. Francis of Assisi Catholic Church in St. Francis. The Mass of Christian Burial, celebrating the life of Elaine R. Gerads, age 89 of Sartell will be 11:00 AM, Friday, February 15 at the St. Francis of Assisi Catholic Church in St. Francis, rural Albany. St. Francis of Assisi Catholic Church in St. Francis, rural Albany.